NASCAR heads to the destination city of Las Vegas, NV today. 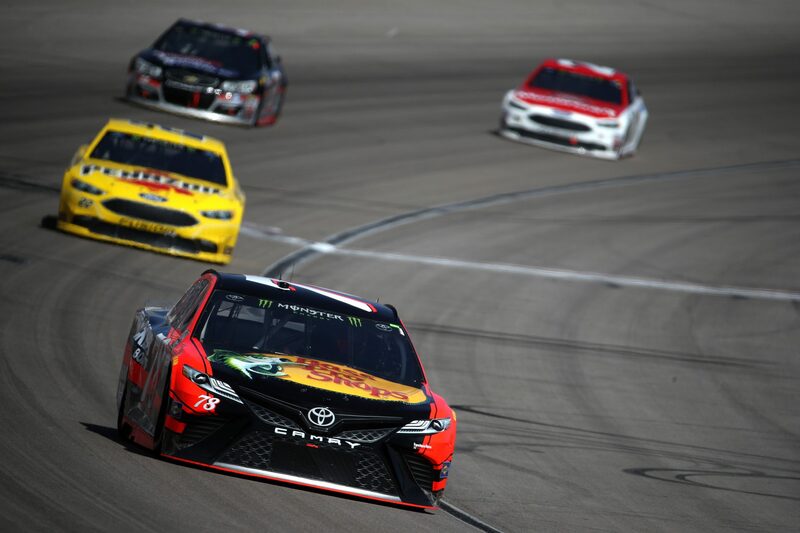 The Monster Energy NASCAR Cup Series is set for battle on the 1.5 mile, Las Vegas Motor Speedway. View full Las Vegas Motor Speedway 2017 results below. Green. Lap 1 of 267, Brad Keseloski who’s sick with laryngitis, leads the field into the first turn. 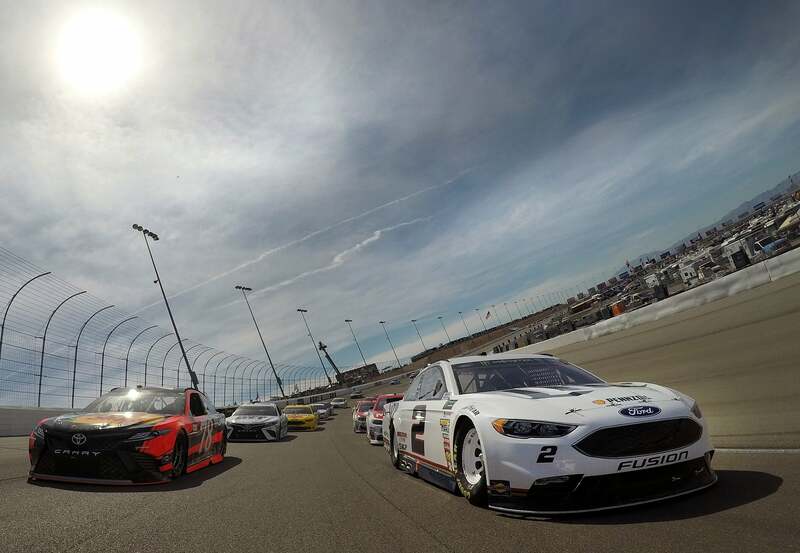 Ford continues their current NASCAR hot streak. Martin Truex Jr, starts outside front row. Turn 3, Keselowski drives it hot to the bottom, slides up in front of Martin Truex Jr, still lap 1. Stage 1 is 80 laps in length. Lap 18, Corey LaJoie has blown up. Oil get splattered under the car, he slides into the wall where he loses the rest of the brakes. They had a new sponsor on the car for this weekend. The JAS Expedited Trucking machine slides to a stop off turn two. Pit stops, Martin Truex Jr beats Brad Keselowski and Team Penske off pit road. Lap 25 of 80 in Stage 1. As Kevin Harvick takes Kyle Larson three wide into turn 1, Keselowski worked to the outside to regain the lead. 33 to go in Stage 1, Joey Logano has reeled in Martin Truex Jr. Yesterday’s winner is looking to make it a Penske, 1-2 at the head of the field. 12 to go in Stage 1, the point leader is in the wall. Big impact for Kevin Harvick in the Stewart-Haas Racing machine. The right front tire blew directly in the center of the tri-oval. Pit stops, Brad Keselowski and Martin Truex Jr hit pit road. Joey Logano takes a Las Vegas gamble, he stays on the race track. Martin Truex Jr beats Brad Keselowski off pit road. But, Joey Logano and Jamie McMurray lead the field, Truex 3rd. McMurray was running 11th before the call to stay out. 5 to go in Stage 1, Jammie McMurray pinches Joey Logano off the corner. They both lose the lead to Martin Truex Jr. 3 wide behind them for 10th. Drivers are racing hard in search of the important stage points. New tires is the correct answer, Martin Truex jr is long gone, Kyle Larson is 2nd. Joey Logano has fallen just inside the top 20. 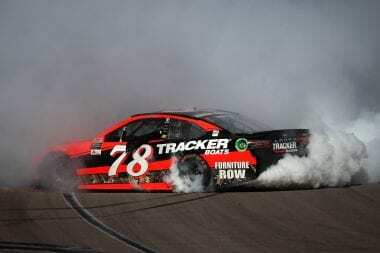 Stage 1 Results: Martin Truex Jr wins Stage 1. He’s followed by 2) Kyle Larson, 3) Ryan Blaney, 4) Brad Keselowski, 5) Chase Elliott, 6) Jammie McMurray, 7) Jimmie Johnson, 8) Kyle Busch, 9) Matt Kenseth and 10) Dale Earnhardt Jr.
Green. Stage 2 is another 80 lap segment. Martin Truex Jr beats Kyle Larson to turn 1. A few laps in, Brad Keselowski has run by Kyle Larson on the outside. Common faces of the race are back at the front. 38 to go in stage 2, green flag pit stops have begun. Paul Menard is the first to the pits. Ryan Blaney follows on the previous lap. 35 to go, the race leader is in the pits. Lap 36, Brad Keselowski is also into the pits. Chase Elliott and Jimmie Johnson both pick up several spots after the pit road cycle. Kyle Busch has been on the radio reporting chassis issues all day, even while running inside the top 5. His day just got worse, caught speeding on pit road. The Las Vegas native will have to server a green flag drive through penalty. His brother Kurt Busch, the other Vegas native is having voltage issues on his Monster Energy sponsored machine. 9 to go in stage 2, the 58 year old Derrike Cope spins off turn 2. Caution. The free pass goes to Kyle Busch, he’s back on the lead lap. Martin Truex Jr, Chase Elliott, Brad Keselowski and Kyle Larson hit pit road. Jimmie Johnson and Kurt Busch stay out. 4 to go, Jimmie Johnson leads the field into turn 1. It doesn’t last long, he slides on corner exit. The entire field drives by. Martin Truex Jr regains the lead, Brad Keselowski 2nd, 3 wide for 5th and 10th. Joey Logono is back, he’s battling Chase Elliott for 4th. They make contact at the line for 4th. Green on the final stage, 101 laps to the finish. Martin Truex Jr and Brad Keselowski lead the field to the restart. Joey Logano takes Kyle Larson 3 wide, he picks up two positions before turn 1, he’s now 4th. Kyle Busch has rebounded, he runs 5th. Martin Truex Jr beats Brad Keselowski off turn 2. 65 to go, Kurt Busch is on pit road, pitting from just outside the top 10. A green flag pit stop to change the battery. The hometown driver and Daytona 500 winner will have a rough finish today. 57 to go, the field has begun pit stop cycles. Lead Martin Truex Jr is on pit road. Brad Keselowski is also in the pits. Jimmie Johnson is taking a risk, he’s the only car that hasn’t pitted, nearly the entire field is 1 lap down. He needs a caution, losing 1.5 seconds per lap on old tires. 40 to go, Jimmie Johnson is the last to find the pits, Truex cycles back to the lead. 31 laps to go, the battle between Martin Truex Jr and Brad Keselowski is heating up. 23 to go, Keselowski is looking to the outside. He takes the lead from Martin Truex Jr.
16 to go, Caution. Danica Patrick carries a wave off smoke behind her. The #10 car has blown an engine. The field pits, Brad Keselowski barely beats Martin Truex Jr off pit road. Jimmie Johnson has to come back to pit road, the crew didn’t get the lug nuts tight. This time, nobody stays out on old tires. Green flag, in 9 laps we will have a winner. The race will be off turn 2. Martin Truex Jr takes the lead on the inside going into turn 1, Brad Keselowski fights back off turn 2, takes the lead back. Kyle Larson is moving forward, passing everyone on the outside, he’s now in 3rd. 5 to go, Brad Keselowski is pulling away from the field. Brad Keselowski might have an issue! Martin Truex Jr just closed the gap. He’s taken the lead with two laps to go! 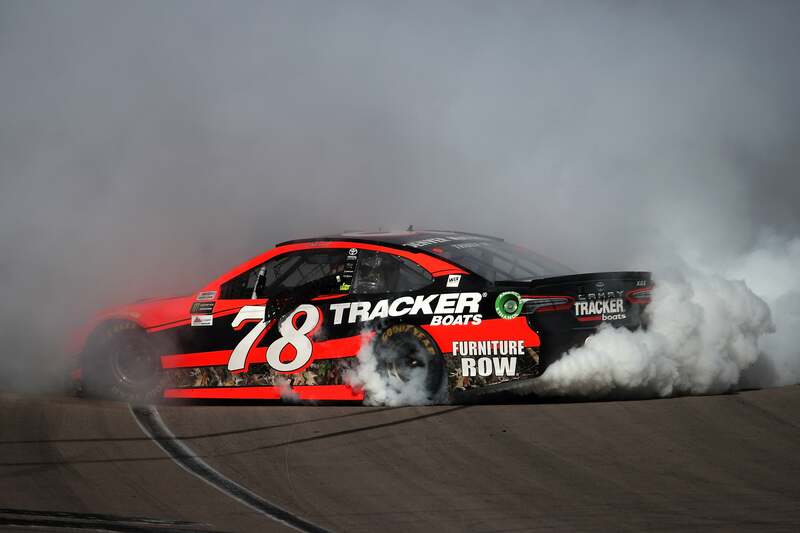 Martin Truex Jr wins Las Vegas Motor Speedway! He becomes the first driver to sweep both stages and pick up the race win. Kyle Larson adds yet another runner up finish to his NASCAR career. Chase Elliot is 3rd. More drama behind the leader! Joey Logano spins Kyle Busch on the final corner. They were battling just inside the top 5. Joey Logano crosses the line 4th as Kyle Busch slides sideways down pitlane. Brad Keselowski limps his car across the line in 5th. As Martin Truex Jr celebrates on the front straight Kyle Busch has taken off in search of Joey Logano. We have a fight! Joey Logano is pulled away quickly. Kyle Busch is now fighting the crew of the #22. They hit the ground. As the dust settles, Kyle Busch surfaces with blood dripping from his forehead. You can watch the on-track contact between Kyle Busch and Joey Logano below. The Las Vegas Motor Speedway final laps video shows what caused the fight on pit road. In the Kyle Busch vs Joey Logano fight video posted below, Kyle Busch did land a punch. The initial punch that started it all, though he might have missed, it’s hard to tell. He walked directly to Joey Logano, calmly. 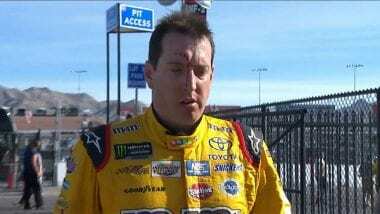 As soon as he got to Joey he wound up and unloaded a punch to the head of Logano, without speaking a word. 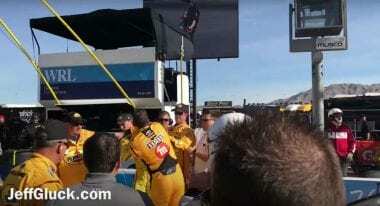 As soon as that punch was thrown Kyle Busch was jumped by about 5 pit crew members from the Joey Logano pit crew.